This is an exciting and ground-breaking project but we still need funds to complete all the work planned and continue paying for satellite data retrieval each month. You can play a vital part in making this project a success by sponsoring a Cuckoo. Become a sponsor for as little as £2 a month via Direct Debit. Or make a one-off donation. Scroll down this page and choose your Cuckoo from the pictures below to make a single donation of £10 or more. If you wish to sponsor a Cuckoo in the name of someone else, please email fundraising [at] bto.org with the sponsor's name and email address, once your payment has been made. If you want to introduce someone to the project and are looking for a gift with a difference, we have a range of Cuckoo Sponsorship Gift Packs to give to a friend or relative, no matter their age. Children's packages start at £20 and adults at £25 and all include a free gift which is posted with information about the project. Order a pack and select your gift item. Tony Davies helped to catch the Cuckoos and named this bird Cameron, in memory of a young naturalist and ornithologist. The Cameron Bespolka Trust has been set up to inspire young people to love and appreciate birds, nature, and our environment. Named by the Suffolk Wildlife Trust as he was tagged at Carlton Marshes in Lowestoft, part of the beautiful Suffolk Broads and a nature reserve managed by the Trust. The Knepp Estate where Knepp the Cuckoo was tagged is a 3,500 acre estate. Since 2001, the land - once intensively farmed - has been devoted to a pioneering re-wilding project. Lambert is the male family name of Isabella Tree who is married to environmentalist Charlie Burrell, the inspiration behind the Knepp Wildland Project. Following a competition, Larry was named by pupils of Valence School, Kent, through our collaboration with EDF Energy and the Pod. Lady Sophia Raymond married William Burrell in 1773. Her father, Sir Charles Raymond, bought Knepp in 1787 and gave the estate to his daughter and the Raymond baronetcy to his son-in-law. Selborne has been named by the Hampshire Ornithological Society to commemorate Gilbert White, the pioneering 18th century naturalist and ornithologist from Selborne in Hampshire. Named by Friends of Thetford Forest after Thomas Paine, political theorist and revolutionary and one of the Founding Fathers of the United States who was born in Thetford in 1736. Victor has been named by Mrs Ann Masters in memory of her husband Vic. Thank you for choosing to support our research. Thanks also to the main funders: The BBC Wildlife Fund, those who supported the BTO Raffle 2010 and Essex & Suffolk Water who have supported the project. Another way you can help is by becoming a BTO member. 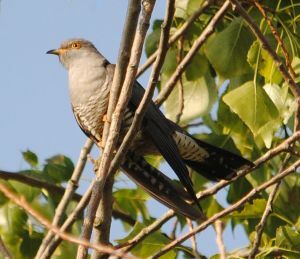 Membership subscriptions provide unrestricted income that helps to fund research projects like the cuckoo tracking project. Members receive regular updates on our survey and research work via our regular members magazine BTO News. Support our projects by becoming a member today and stay up-to-date with all our latest news.